The week started like all other Bike Camps: practicing rules of the road, turn signals, and mapping day trips around Portland. This was only the beginning, however, as the overnight Bike Campers were eager to fulfill the “overnight” portion of their name. 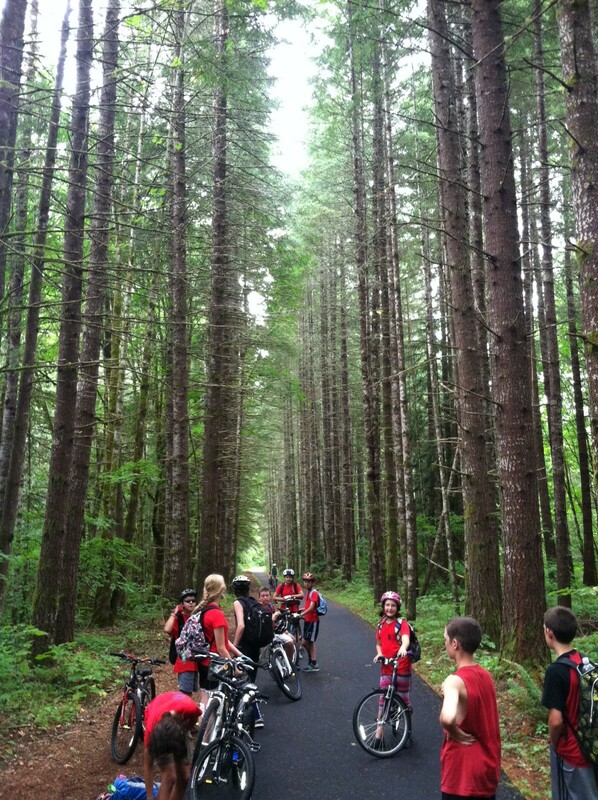 It was all a matter of training for the big trip northwest to Stub Stewart on the beautiful Banks-Veronia Trail. The first half of the week allowed instructors and campers to learn the strengths of the group and form a cohesive team. Through longer trips to the Springwater Trail and Arbor Lodge, and uphill battles on Mt. Tabor, the group developed the expertise necessary for the long, arduous journey to come. Thursday morning, with a slight mist in the air, the team of 14 self-proclaimed ”Rainbow Ninjas” set out on the road with high energy and a lot of anticipation. 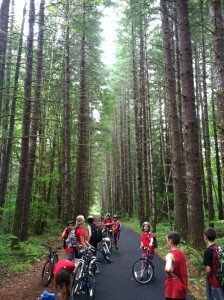 The route began with pod formation biking – a riding technique that allowed us to safely navigate through downtown to the Max for an expedited trip to Hillsboro. From there it was all country roads kept cool by cloud cover and a slight drizzle. By 1pm, the group reached the Banks-Vernonia trailhead just in time to be treated to fresh wild berries and free popsicles from Banks Bicycle and Repair Shop. The next three hours challenged the group’s uphill climbing skills and endurance. They reached the campsite in record time, with the whole group on site by 3:30 pm. With seemingly endless energy, they played ultimate Frisbee, lava monster, did some night biking, and finished with s’mores around the fire. It didn’t appear as if anything could get the group settled enough for sleep, but with some bedtime stories and a clear night sky, everyone quickly drifted off in preparation for another full day of riding. Friday, at the crack of dawn, everyone packed up camp and got ready for another 25 miles back to OMSI, the host of our Bike Camp. The ride home, made easier by being downhill, went even smoother than the previous day. The team, now expert riders, made it back to downtown Portland by 1pm, allowing for ample time to play in the Salmon Street Fountain. Cooled off by the water but still tired from the 52 miles biked in two days, we slowly coasted back to OMSI for some reflection and napping in the shade of tents. 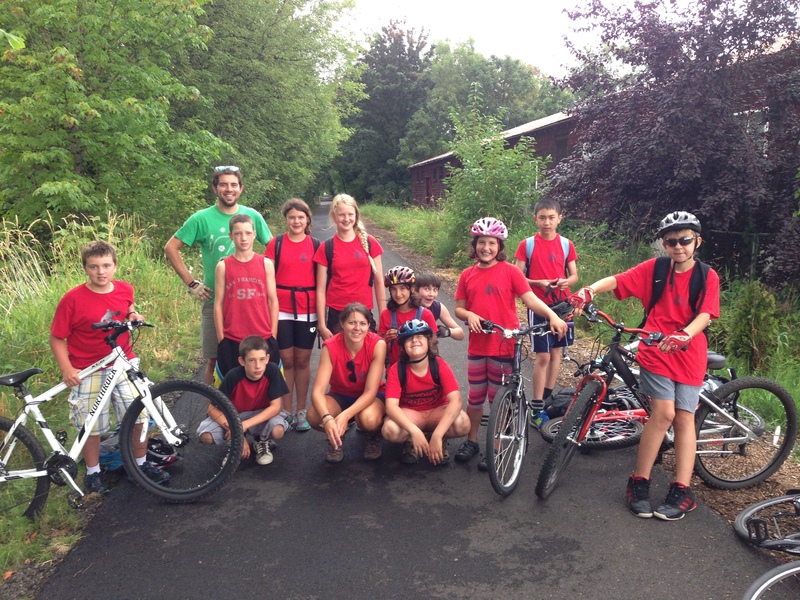 It was an amazing week, a true Bike Camp experience.